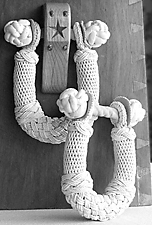 I do know they are generally thought to be the hardest piece of knotwork for the sailor to tie. Once tied, painted and installed on the side of his personal chest (locker) he has every right to consider it a personal masterpiece. When I tie beckets I often catch myself holding my breath during a particularly tricky step in the building process. It's hard to find words to convey the special touch needed to tie a pair of these intricate beauties. The key word here is "pair". It's hard to make one, never mind making a masterpiece times two. I've tried to imagine the sailors a hundred years ago working on one, with roughened hands and calloused fingers, the ship pitching back and forth. Now that's dedication. 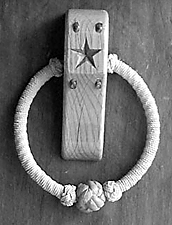 Sailors of today still tie these elaborate box handles. I've had the pleasure and privilege of visiting and sailing on a number of modern day ships and I've seen a dozen beckets in different stages. These three legged bow fenders are a new addition to my product line. 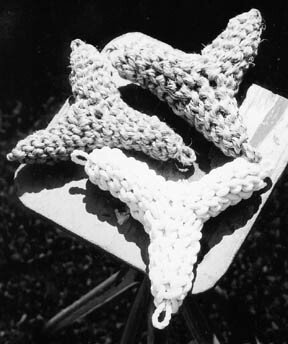 They offer flexible but solid protection against scrapes and bumps to the bow of your vessel, and will keep your bow from doing mischief to someone else's hull. Available in 6" and 12" legs and in custom sizes. 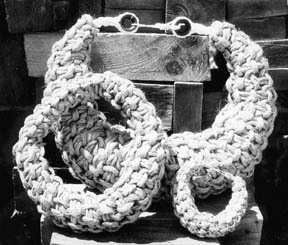 A sailor's sea chest was often finished with elaborately knotted decorative handles, called beckets. My beckets are as sturdily made as any from centuries past and are available in three different styles. 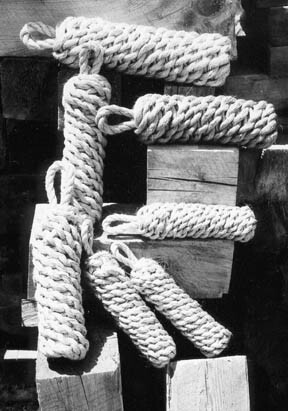 These useful fenders are hung from the side of a boat to protect agains scuffs and scrapes when coming alongside a dock or another vessel. Made only from the finest #1 grade manila, they are available in a range of sizes. These large bow fenders are bushy golden mats that offer real protection and industrial strength durability for larger vessels. Available in three standard sizes and custom sizes. Custom sizes priced by the square foot at $48.00 / S.F. 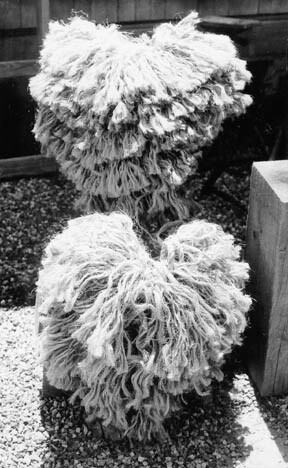 This is another type of bow fender, sometimes called a bow pudding. 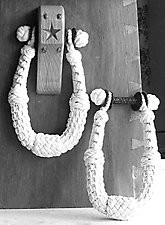 Made of white synthetic (not polypropelene) or manila rope, they are among my favorite fittings and are flexible enough to conform to the sharpest bow. The fenders pictured here range from 2" x 20" to 10" x 72". 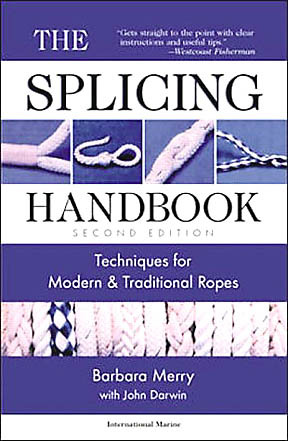 The only book devoted completely to splicing today's ropes, this fully illustrated, step-by-step guide has been expanded and enhanced in this new edition and now covers wire splices, and splices in Spectra and Kevlar ropes as well as Dacron braid and traditional three-strand. 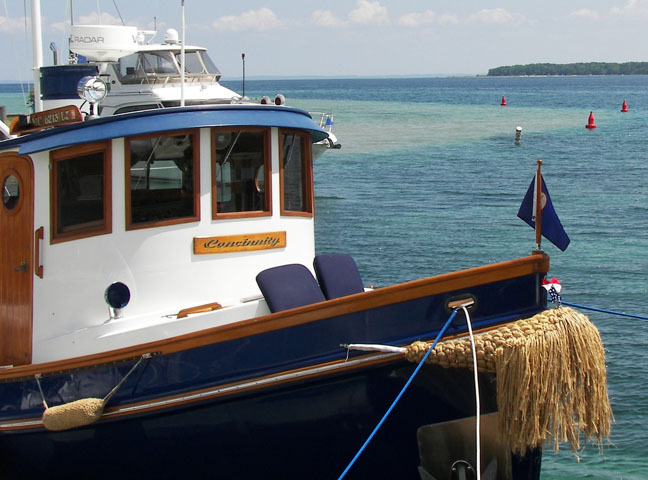 The Splicing Handbook includes every splice project a boater will ever need. If You Like Any of Our Products . . .